Discounts now Supported in Craftybase! We’ve just added the ability for you to track the actual discount amount on each sale you make - you’ll now find a new box on your sales page to enter in the component of the sale you provided as a discount. Etsy sellers will find that all sales will now import the discount amount automatically - along with the actual coupon code that your customer used. 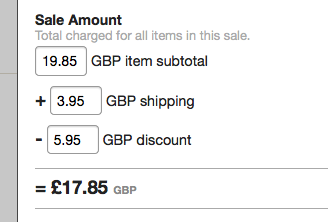 We also now automagically detect if the coupon was for shipping and adjust your shipping totals for you. Etsy importing now even faster!